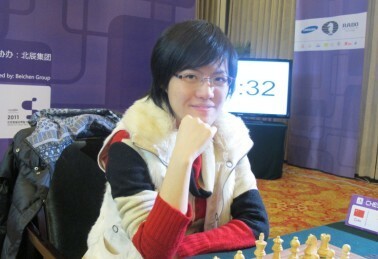 Women's world champion Hou Yifan from China is the leader of the women's blitz tournament after 8 rounds. Hou gained the same points as the leader of men's blitz tournament Shakhriyar Mamedyarov: 6,5 out of 8. In a short interview with the Women's World Champion, Hou Yifan said that it was sometimes difficult to change her frame of mind so quickly after the rapid event. "In this kind of game we don't have time to calculate everything. Just 3 mins for a game! It's easy for everyone to make mistakes, I might have made some mistakes, but I don't know yet because I don't check the games now. Blitz is one type of chess arts, the interested part is that you never give up, because the position changes time to time. I will try my best." said Hou. Anna Muzychuk, Yelena Dembo and Kateryna Lahno are sharing the 2-4th place with 5.5 points. Dronavalli Harika has 5 points. The champion of rapid tournament Alexandra Kostenuik gained 4.5 points, standing 6-8th place with Nana Dzagnidze from Georgia and Antoaneta Stefanova from Bulgaria.